This week Liv interviewed Zach Job. When I asked the recovery community for a more diverse example of recovery, Tawny Lara of SobrieTea Party immediately suggested Zach — who had recently performed in Drag at Readings on Recovery. She was spot on. Zach is incredible. I'll let him introduce himself and her drag-self. I am a 36-year-old kid who has lived all over the world, including the Philippines, Dubai, Minnesota, New York, Honduras, New York, Chicago, and back to New York. I am constantly exploring, trying new things, and taking risks because I believe you have to get uncomfortable to become comfortable. That mindset, I believe, is the only way to really truly discover who you really are. I have been on a journey of self discovery for some time, but I feel in the last two years I have really come to understand myself and my purpose! I used to be upset at the world and used to think "If only" a lot. If only I were tall; if only I were white; if only I didn't have a birthmark on my face; if only I weren't gay. Those things I realized I couldn't change, and after many many years, I have come to embrace those aspects of me. All the other things though, I realized I could change and I did! I am an artist now, I found love and I am married, I am an athlete (dodgeball, dance, and Acroyoga) and in the best shape of my life, I stopped drinking 10 months ago to be a better version of myself, and now I truly believe I am living my best life and enjoying the hell out of it- at least the parts I can control. Liv: We know that the LGBTQ+ community is at a higher risk of substance use disorder. As a member of that community, what influence did that have on your drinking? It was like I was in the Tom Hanks movie BIG, but a gay version, in that every adult gay encounter felt like it was experienced by a child in an adult body. Zach: I’m curious to know why that is. I have my assumptions based on my experience and what I see. I 1 feel like it has a lot to do with the perception that alcohol and drugs lubricate a situation and make things easier. When I first came to terms with being gay I was 20. But, in a way, I was a teenager in the sense of my experiences. I had my first real kiss after I came out, and I was already a man! It was like I was in the Tom Hanks movie BIG, but a gay version, in that every adult gay encounter felt like it was experienced by a child in an adult body. Alcohol made things much easier to cope and seemed like a unifying force within the community. For me, being a part of the LGBTQ+ community was super scary at first; I wasn’t taught it, I wasn’t introduced to it, I wasn’t a part of it. I had to take those steps on my own, and it was terrifying. The very first thing I did was go into a bar, because that’s the only place I knew where gay people existed. And it just carried on from there. My sources of information were the gay mags in the bars, and all social activities revolved around those bars and clubs as well. Liv: You got sober in October 2017. Tell me what led to your decision to get sober—what was going through your mind? Zach: I had always been super active. In my 20’s I could drink like a champ and still run a marathon the next morning on 4 hrs of sleep. That year I did it in 4 hrs and 4mins, beating P Diddy. I didn’t even train! I was also into dodgeball, working out, Yoga, Dance, Gymnastics, and skateboarding. I was bartending and going out almost every night with friends or on dates. Even though I’m married now, I would still try to fill my days and nights with activities and still go out to bars with my husband. I transferred to a day job about 4 years ago, but I was/am completely a night owl. It became painfully obvious I was no spring chicken anymore, however. Whole weekends would be lost to recovering from a Friday night out. I ate like crap to “soak up the alcohol”. I’d black out more. I definitely did not have the time or energy to maintain my lifestyle, so over time I didn’t. I spent much more time at home on the couch and kind of coasted. I had to cut a lot of things out of my life, but the one constant was my drinking. Honestly the first thing that came to mind was to stop drinking. I knew that would make me a better version of myself. It would allow me to become that super active person I once was too. Since I graduated High School in 1999, I have applied to be on the show Survivor. I have submitted tape after tape. 4 years ago I thought I submitted my best tape yet. 6 months later I got a call back. It was February and they wanted a quick turn around of another video showing off my muscles and selling myself on camera again. That winter I had really let myself go and had gained about 20 lbs from my initial audition tape. My husband thinks it was my attempt at a mustache that cost me my spot on the show, but I feel like it was my soft body. Who knows really, it could have been any number of things. I know a hot body would have helped, but in my mind at that moment, I thought to myself, ‘That was the best tape I put together and it was the most honest and truthful (unlike many of the others I had turned in). What more could I do?’ That’s when I realized, if it’s me that they initially liked, then I just have to be a better version of myself. But how? Honestly the first thing that came to mind was to stop drinking. I knew that would make me a better version of myself. It would allow me to become that super active person I once was too. The person that accomplished so many things, and the person that attracted my husband in the first place. And maybe, it would help me get into better shape too. I already knew alcohol didn’t add anything to my life. That was further proven by discovering Daybreaker, a sober morning rave. I found out during those pre-dawn parties that I could get to the same place mentally that I thought I needed alcohol for in a club-like setting. It was 2 empowering. So that, along with the idea to be a better person, I made the choice to quit drinking, and I did just like that *snap*. Liv: What challenges have you faced as a sober member of the queer community? Zach: Really, the biggest challenge is that alcohol is very prevalent in most queer social activities. I can handle being around it, but it is annoying more than anything when there is a happy hour for an alcoholic drink, but the virgin version is full price for some reason, or friends want to do a bottomless brunch and I’m stuck on a different wavelength by the end and paying for the same amount. It seems the way to be integrated in the queer community and rub shoulders with the “A gays” is still through bars and clubs where alcohol and drugs are super prevalent. Trying to get some of my friends to participate in the sober activities I have found is difficult as well. Over time I cultivated quite the list of activities and have them saved in my phone. I honestly didn’t realize how predominantly straight those activities were though until approached to do this interview. The truth is though, that I have also found a way to be completely comfortable in clubs where dancing has become my main focus. The only other thing is this concept (which could exist outside of the queer community) that because I am sober that that must have meant I had a big problem and probably went into rehab. Not to diminish anyone who has , or to say my journey is better or whatever, but it’s just that there clearly is a stigma to being sober and it almost feels sometimes like people are tiptoeing around me, or apologizing for drinking in front of me. On the positive, I have discovered some of my queer friends also have stopped drinking or are great about choosing activities that don’t require alcohol. The truth is though, that I have also found a way to be completely comfortable in clubs where dancing has become my main focus. Bars I don’t go to as much, but clubs where I can dance, it has become a new kind of fun. Plus now I leave a little earlier, save a ton of money, remember everything that has happened, and I can still bike home and get good sleep. Liv: You performed at Readings of Recovery and talked about how fear manifests in your life. You mentioned that you fear failing at what it means to be sober. What does the concept of being sober mean to you? And, how does that fear impact your recovery? Zach: That was such a powerful moment for me to get up in front of people and share my story. I didn’t know there was a place for someone like me to give my perspective, but I realized quickly after listening and talking that obviously sobriety too, exists on a spectrum. It’s so individual and everyone’s journey is to be valued and respected. Previous to my recovery, I was just as guilty thinking that a person in recovery meant that they hit some sort of rock bottom and must have had a traumatic or near death experience. I would think, ‘was my drinking enough of a problem that I get to talk about it?’ or ‘Do I belong in this group, or will people think I am a fraud?’ Those thoughts were actually scary enough to not really open up about it at first. I didn’t really know how to respond when someone asked if I wanted a drink. Do I say, “I don’t drink” or “I’m sober”? Inevitably the follow up would be an uncomfortable “I’m sorry I didn’t know” from that person and a feeling that they thought that I must have had a serious problem too. My discomfort in that moment told me that I too must have some sort of bias, because God forbid anyone thought I went to AA. I hated that I thought that way. That unfortunately probably made me keep my distance from sober people actually for a while. It was this want/feeling to dissociate from that, but also the fear of being discovered as a phony. I felt I wasn’t a true sober person, whatever that meant. In the end, drinking was enough of a problem for me though. Also, how could I be a fraud if that was my truth? As soon as I opened up I found people like me; people who were just as open with completely different stories yet still as accepting. The biggest common denominator is that we are all seeking our truth and trying to live our most authentic life, no 3 matter how harsh that light is shining back down on that reflection we see of our new selves. Being sober to me is looking at your reflection clear in the eyes and finding peace in that gaze. Liv: You talked the parallels between performing in drag and being sober. 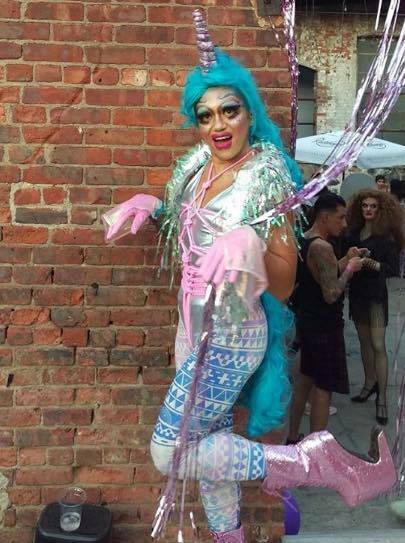 How has drag helped your sobriety? Zach: Drag is almost as new as my sobriety. They have sort of helped each other in a way. Drag has become an incredible artistic outlet, and takes a lot of time and energy and money I probably wouldn’t have if I drank still! But I entered drag in a very unconventional way and just like my sobriety I felt again that I was a fraud in that world. The imposter syndrome is real. Almost right away, however, I’ve been managing to carve my own niche within drag and it’s undeniable that I am coming up with art that is original and appreciated. Most importantly though, I discovered that again, if I am doing my drag borne out of truth and honesty, it is vali! I love that my drag is individual to me, just like my story of being sober. That is valid too. It’s funny that caking on makeup and wearing a dress and wigs completely covering my body can be a way of expressing my truth in a very similar yet paradoxical way to being sober in that I am completely exposed. In my sobriety I cannot hide behind alcohol and in knowing that, I recognize my choices are 100 percent mine. But they are the most similar in that they are both an extension of who I am. The only difference is I don’t get paid with money for that extra external validation for being sober, although I do save a ton of cash! Liv: You mentioned that the TV show Survivor had influenced your recovery. How so? Zach: I mentioned before, but I am so driven to get on this show, that the only thing I think I can do for them to pick me is to be a better version of myself. So, that is what I am working to become. In this past year, I have dropped 20+ pounds, I am in the best shape of my life, probably because I don't drink those calories, but more so because I am making healthier choices overall. If I don’t get on this damn show, then I still want something to show for it, and a good healthy life is a pretty damn good side effect. I value my life so much more and want to live in it so much more. It has been the best strategy to get on the show I can think of because it has reversed time and I look and act like I am in my 20’s again- minus the alcohol part. Seeing and feeling these positive changes keeps me incredibly motivated to see how much further I can take this. I am excited every day. That wasn’t the case before, and I love this new feeling. Liv: I love how you said that, as a sober person, you’re more active and alive than you have ever been. How has sobriety opened the door to a more fulfilling life? 5. Recognizing that you are the creator of your own world and when you are sober, that means you are in complete control over your choices. It can be a lot of pressure, but really it is super empowering. If those choices are made with a pure heart then you can’t go wrong.